If you are new to the Bible and want to know some of the most famous Bible stories, here are a few to get you started. Maybe you are teaching a Sunday School class or a group of children in your neighborhood; these stories are great ones to always have ready to tell. Fundamental to understanding the Bible is the story of creation. God made the world and everything in it in six days and then He rested on the seventh. God spoke everything into existence with the exception of when He created humans. At that point God got personal and formed man from the dust of the ground and the woman from a rib of the man. The Bible tells us what God created on each day. The first day He created a formless, watery earth, and light and darkness. On day number two He separated the water, of which the earth consisted, into two parts. This separation is what we would call the sky today. The Bible calls it the firmament. The water above the firmament was the heavens and the water below became the earth. The third day God created the dry ground which was separate from the sea. Plants and trees came forth from the ground. Of the first three days, there is a corresponding creation in the next three. Day one was light and darkness. On day four God created the sun, moon and stars to rule the light and darkness. The second day God created the water and the sky. On the fifth day He created fish for the sea and birds for the air. The corresponding creation to day number three (land and plants) is day number six in which He created animals and humans to live on the land. On the seventh day God rested. He did not rest because He was tired. He rested to show His creation was complete and to teach us a principle: we are created to take time off of work for worship and reflection of who God is. Our bodies were not created to labor constantly. We need the rest that He demonstrates for us from the very beginning of the world. Noah’s Ark is one of the most well known Bible stories. God looked down on the earth and saw that people were growing increasingly wicked and needed to come back to Him. God chose Noah to do an important task. Not only did God want Noah to build an ark to save the animals, but He wanted Noah to preach to the people and persuade them to repent of their sins and be saved from the coming flood by entering the ark. Noah built the ark and preached to the people. 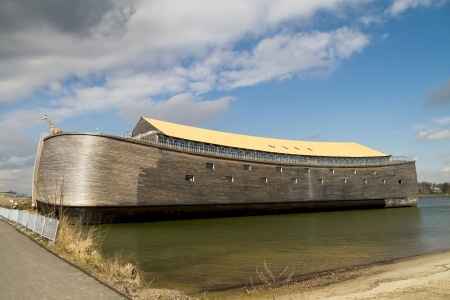 God gave Noah all the information needed to construct the large boat. When time came for the flood that would destroy the earth, God brought the animals to Noah and his family. They loaded the animals on the ark and pleaded with the people to join them. But no one besides Noah, his wife, his sons and their wives came into the boat. Eight people were saved from the flood. After the rain stopped Noah sent out birds to help him know when it was safe to leave the ark and begin living on land again. God gave Noah and his family the same command He gave Adam and Eve several generations previously: be fruitful and multiply. God commanded them to repopulate the earth. The story of the life of Joseph is a very long one in the Bible. But one of the favorite parts of the story is the story of Joseph’s dreams and the coat of many colors his father gave him. Joseph’s dad was Jacob. He had two wives, Leah and Rachel. Jacob was tricked into marrying Leah even though he loved Rachel more. Of all Jacob’s children, Joseph was his favorite. He was Rachel’s only son at that time (another baby was born later). Joseph and his older brothers did not get along very well. Part of the problem was that Joseph had a dream in which he was the hero. His dream said that one day his brothers would bow before him. It was bad enough that he had that dream one time, but then he had it again. It was a little different each time, but the lesson was the same: Joseph would become the leader of his whole family. One day Jacob gave a beautiful multicolored coat to Joseph. His brothers were jealous. Jacob was telling all of them that Joseph was his favorite. When the brothers were away from the house one day they devised a plan to kill Joseph. However, instead of killing him they sold him into slavery. They took the beautiful coat, tore it up, and dipped it in blood. They told Jacob that a wild animal had eaten his favorite son. God’s hand was on Joseph’s life. Even though he became a slave and his life was not easy, Joseph did indeed become the leader of his family and his brothers bowed before him like his dreams said they would. Moses was one of the boys that the ruler of Egypt (called Pharaoh) tried to kill as a baby. But he was not killed and ended up growing up in the family of Pharaoh. Moses knew that he was not from the country of Egypt even though he grew up in Pharaoh’s house. His people were the Israelites. Though they were slaves to the Egyptians, Moses preferred to be identified with them. Moses was sent away from Egypt. While Moses was away from his people and the Egyptians, God appeared to him in the form of a burning bush. God told Moses to return to Pharaoh and lead the people of God away to the promised land. Though he was scared, Moses obeyed God. Through negotiations the Israelites were finally able to leave Egypt after 400 years of slavery. God brought 10 plagues on the people of Egypt. This caused the people to release the children of Israel to go their way. But Pharaoh had trouble letting all the slaves go free. He chased them with his army to the Red Sea. Moses and the people of God walked on dry ground after God split the waters open for them. When the Egyptians tried to cross, God closed up the waters and the Egyptian army was drowned. The children of Israel were ready to possess the land that God had promised them. They were done wandering in the wilderness, which they had done for 40 years. But their first obstacle was the great walled city of Jericho. Joshua, the leader of Israel, sent spies into Jericho to find out as much as they could about the city. The spies returned and Joshua began making plans. God appeared to Joshua one day and told him how to destroy the city. God’s plan was that Joshua and his army would walk around the city of Jericho one time a day for six days. They would not say anything. On the seventh day they would walk around the city seven times. Joshua and the people of Israel followed God’s plan. Their final lap around the city the priests blew their trumpets and the people shouted. The walls of Jericho fell down flat and the people of Israel had a great victory. Probably one of the first stories children learn and remember is the story of David and Goliath. Israel was at war with their enemies, the Philistines. David was just a young boy—probably only 12 to 17 years old at the time of this war. He went to the battlefield to take food to his brothers. When David arrived at the battle he was shocked and angered to hear the champion of the Philistine army telling lies about God. This man was a giant named Goliath. Goliath stood about nine and a half feet tall! Goliath’s height and strength did not bother David. He was only concerned with making sure God’s name was not cheapened before the enemy. David fought Goliath, not with spears, sword or bow and arrow, but with a sling, a rock and faith in God. David launched a rock from his slingshot that sunk into Goliath’s forehead. When Goliath fell, David pulled out the giant sword and cut off the head of Goliath. The enemy of God were defeated that day. God told Jonah to go to the city of Nineveh and preach to them. It was a wicked city that did not know about God’s Word. But Jonah was scared of the people and did not really want to see them turn to God and follow Him. So instead of going to preach to them he got on a boat going the opposite way. While on the boat a storm came. The sailors on the boat were afraid and seemed to know that the storm was a supernatural one. They tried to figure out who had offended God and caused the storm. Jonah knew it was him. The only way for the sailors to be saved was to get rid of Jonah. He asked them to throw him into the ocean. The sailors tried to save the ship without tossing Jonah into the water, but they finally decided that Jonah had to go overboard. God prepared a large fish to carry Jonah back to land. The whale swallowed Jonah. Jonah prayed to God to forgive him for running away. The whale then took Jonah back and vomited him out at the beach. Jonah quickly obeyed God and preached to the people of Nineveh. But not everything went well with Jonah after that. To his disappointment, the people of Nineveh actually listened to his preaching and they got right with God. Jonah agreed to obey God and preach, but he was still hoping they would reject God’s message and that God would destroy them. The story of Jonah ended with him telling God how disappointed he was that God allowed the people of Nineveh to live. The birth of our Lord Jesus was miraculous and well documented in the scriptures. From the Old Testament we are told when and where Jesus, the Messiah, would be born. An angel appeared to Mary to tell her that she was going to have a baby even though she was not yet married and had never had sexual relations with a man. The baby inside of her was the One promised to Adam and Even in the Garden of Eden(Genesis 3:15). Mary and Joseph subsequently married and went to Bethlehem for a government census. A group of shepherds cared for their flock of sheep. Wise men from the east knew the prophecies of the Old Testament and came to see the Redeemer. Mary and Joseph found rest in a stable. The baby Jesus was born. Angels appeared to the shepherds to tell them the good news of peace that had come to the world. The wise men used their wisdom to find the Messiah and avoid revealing His location to the wicked King Herod who wanted to kill the King of Heaven. We don’t know the date Jesus was born but we celebrate the event at Christmas. The birth of the Son of God into this world is a great Bible story to learn. There are several stories of Jesus feeding the multitude of people who followed him. One of my favorite is when Jesus fed 5,000 men (besides women and children). He had been teaching all day out away from any town. The people were tired and hungry. Jesus asked His disciples how they could feed so many people. Jesus did not ask this because He did not know what to do, but because He wanted His disciples to think about the great miracle He was about to perform. The disciples looked around and found a boy with a lunch. The lunch was some bread and fish. Jesus took the lunch and prayed over it. Then He broke the bread and fish and gave each of the disciples some of the food. The disciples began distributing the bread and fish to the people. The Bible says that they gave everyone as much to eat as they wanted. When it was done there were still 12 baskets full of bread. Jesus sent the disciples across the sea of Galilee while He went to pray for the night. As they crossed the sea a storm came up. The disciples were working hard to make it to the other shore. Jesus came walking across the water to them. Once they were satisfied that it was the Lord and not some evil spirit, Peter wanted to walk on the water as well. Things started well for Peter. As he focused on the Lord he ignored the storm around him. But, the Bible says, he took his eyes off of Jesus and began to sink. Jesus lifted him up and brought him back to the boat. Of course there are many more stories in the Bible. Many times when I read one I see something I had not seen before. For example: did you know that in the story of Noah’s Ark that we don’t know anything that Noah said to God? Noah simply obeyed and worshiped God in the story. Take time to read these stories (and many others) as if you are reading them for the first time. You might be amazed as to how applicable they are to your life today. You may also see something you’ve never seen before.